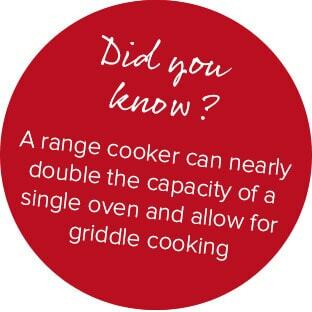 Why choose a range cooker? Choosing what you will cook with depends on how you are going to use your kitchen space. 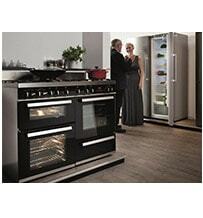 With a range cooker, everything is neatly combined to provide a multifunctional cooking area. Whether you need more or less cooking capacity, a single or double oven can still only handle the baking, roasting and grilling. You will still need to install a hob to cover all of the boiling, simmering and frying that goes with day to day cooking. 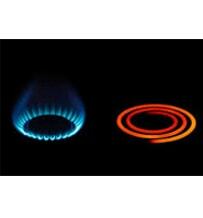 A range cooker takes care of everything. A range cooker not only performs all of the multifunctional cooking tasks that are required in a modern kitchen, it also provides a central focal point for your design. 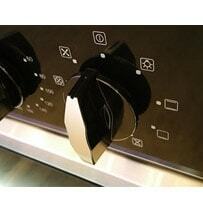 It naturally draws the eye and, when combined with an extractor, can really make a statement in the home. One of the main advantages of having a range cooker in your home is that you can have a centralised work station that includes multiple ovens and a spacious hob. With separate oven and hob units, you can flexibly move the cooking areas to convenient locations in your kitchen but with a range cooker you create a roomy cooking zone. This is a definite plus for many people. When choosing a hob, you can decide between the fuel types available and then select a size from 60cm to 90cm, depending on your requirements. 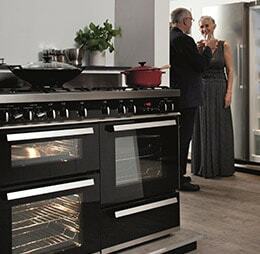 With a range cooker hob you also have the choice of gas or ceramic cooking and get plenty of room between the cooking zones for pan handles, adding ingredients and keeping everything under control. The hob sizes available start at 70cm, which is larger than a standard hob, and go up to a ginormous 120cm wide on the RV1200SS model. 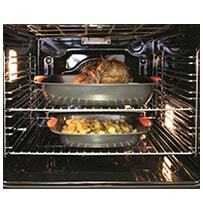 All our range cooker models include at least two oven cavities and some have three. The advantages of having more than one oven cavity are that you can cook even more food at the same time and use different cooking functions simultaneously, for example grilling in one oven whilst baking in another. The space available in a range cooker allows you to be flexible with your cooking style, cope with challenging cooking events in the home more easily and prepare multiple courses simultaneously. The layout of the double or triple oven cavities on a range cooker may even suit your requirements better than a double oven where the cavities are situated one above the other. On a range cooker the oven cavities are side by side, with an additional third cavity on top of one oven on the larger models. 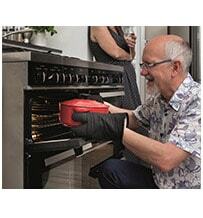 This could mean less bending down and that food is easier to put in or take out of the oven. 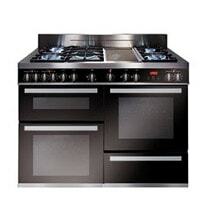 If space is at a premium in your kitchen, don’t discount the range cooker purely because it is a large appliance. Our range cookers also come with an additional storage drawer at the base which is handy for getting baking sheets, roasting trays and oven dishes out of sight. This could work well if you are lacking in storage in your kitchen. This storage drawer also works like a warming drawer when the ovens are switched on and can conveniently warm plates and serving dishes ready for mealtimes. As well as looking great, a range cooker could also work out as a cheaper option for your kitchen as you only need to buy one appliance instead of several separate ones. What’s more, if you ever move house you can take your beloved range with you.